In 1872, American women couldn't vote, but they could run for president. to own a newspaper or to speak before Congress? age of eight as a child preacher. Seeking a better life, she married, divorced, moved to New York City, and became a millionaire by offering Cornelius Vanderbilt financial advice from the spirit world. of the United States. She founded her own newspaper to publicize this groundbreaking campaign, which took her from the chambers of Congress to the glorious moment when she was nominated by the Equal Rights Party at a convention that she, a woman, had organized and funded. 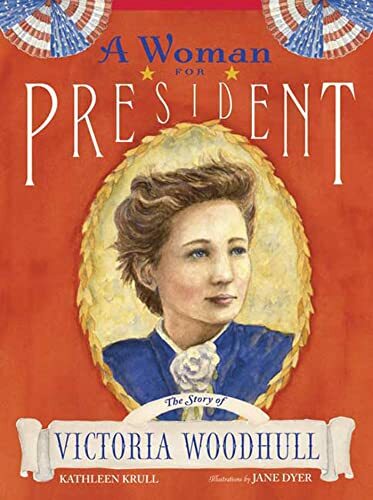 In the first book about Victoria Woodhull for young readers, Kathleen Krull and Jane Dyer team up to bring one of the most fascinating personalities in U.S. history to life. - The perfect book to explore the electoral process during the upcoming presidential election. - Walker & Company is proud to welcome acclaimed biographer Kathleen Krull and talented illustrator Jane Dyer to our list. When Kathleen Krull was fifteen, she was fired from her part-time job at the public library for reading too much. She took that passion to her career in children's books and has become a noted biographer for children. Her Wilma Unlimited was named an ALA Notable; her Lives of the Presidents was a School Library Journal Best Book of the Year and a Boston Globe/Horn Book honor book; and her nonfiction has won innumerable other awards. A Woman for President is Kathleen's first book with Walker & Company. She lives with her husband, illustrator Paul Brewer, in San Diego, California. Jane Dyer is the beloved illustrator of many bestselling picture-books, including Time for Bed by Mem Fox, Babies on the Go by Linda Ashman, and I Love You Like Crazy Cakes by Rose Lewis, which received a starred review from Kirkus Reviews and was a New York Times bestseller. She brings her talented hand to picture-book biography for the first time in A Woman for President. Jane lives in Northampton, Massachusetts.